Charlie Bears Hans Discounts Apply ! Our Toy Soldier Hans is sure to impress and has been created using neutral tones in a short pile Mohair. He is fully jointed and able to stand unaided as he has flat paw pads. He has a hand -embroidered nose and additional eye whites have been used to enhance his expressive eyes. 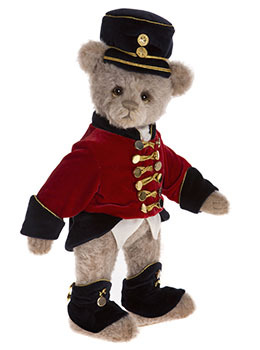 His fixed tailored uniform has been made using soft vibrant fabrics with gold embellishments, which I am sure you will agree really do make him stand out from the crowd. His musical box inside him plays his favourite tune from Tchaikovskys ballet the Nutcracker.